These are adorable! I love chocolate and peppermint! These look yummy. I love the little cupcake cases and your piped frosting looks so good. These look super cute and the pictures are great. You should share them over at http://www.dishfolio.com. Keep the cupcakes coming, I love cupcakes! These ones are so pretty too! You can never have too many cupcakes! These are so cute. 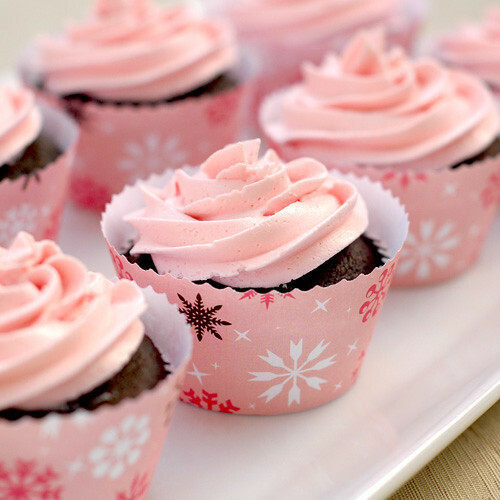 Cute and lovely pink cupcake they are! gorgeous photo, beautiful colour contrasts. I love the color theme of the cupcakes! They are truly gorgeous! Your daughter is lucky! Can I ask what decorating tip you used? I love the piping! Thanks! Thank you so much! I used the large star tip, I think it is a Wilton, and I bought it at Michaels. on December 20, 2010 at 4:57 pm | Reply Michelle T.
Where did you get the cute pink wrappers from? Your cupcakes are beautiful! And I bet they taste great too! I found you over at DishFolio. Lovely cookies and these are perfect for lover’s date. I’ll try some of this for my parent’s anniversary. Thanks for the recipe. 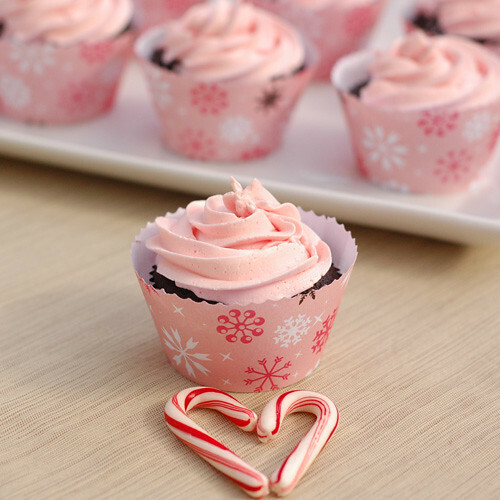 I’m loving the look of these cupcakes and the flavor profile is ideal for winter time. I like the high collar of the liner – it adds panache to an already glamorous treat! Thank you for sharing and happy baking! how many cupcakes did the recipe make? It makes about 24 cupcakes. Enjoy!